We see still and moving images constantly and as creatives we can’t help but be inspired by them. Mostly we'll glance and forget what passed in front of us but occasionally something will catch our eye so we pause to take a deeper look beyond the aesthetic and wonder how was that made. What techniques were used? What gear? What settings? How, why, when? So many questions! Really this is a natural process, to see something and be inquisitive about what went in to putting it together. As creatives this helps us to go on and make more of our own work, always bearing in mind that we need to be inspired and not to copy. It’s easy to see a wonderful creation and decide to copy it but for anyone serious about making anything interesting, copying someone else’s creation is deeply unsatisfying. Plagiarism is wrong. After seeing that great work and feeling the inspiration welling up it can be useful to deconstruct or reverse-engineer the image and see how it was made. By looking for clues we can identify techniques, learn and apply to our own creations. So lets take a look at how to deconstruct. Before we start, in this article we’ll see how it applies to photography but the techniques can be used with film too, however film also has the additional components of sound and movement so even more things to examine. It doesn’t matter where the process of deconstruction starts, it really depends on what caught the eye and the importance of that in the makeup of the work. How an image is lit contributes greatly to the look of the scene. From sunlight to flash, to strobe to multi-strobe to multi-strobe and sunlight, there are many combinations and setups to consider and some will obviously be easier than others to pick out. We all know that an image is light and dark, so where has the main light come from? Where are the shadows? Are there highlights on the subject that indicate additional lights somewhere out of shot? Lighting would be discussed differently depending on the subject. For instance, how a travel image is lit will be different to a product or portrait image but there will always be a key light, which supplies the main source to illuminate the subject. If the subject is a game of football in the local park then it isn’t too difficult to work out the main light is probably the Sun. Interestingly though, the Sun can still light part of the image yet not be the key light, it becomes a secondary light. Looking at our full-length cyclist portrait, the Sun is behind the subject lighting the rear of the picture but the key light is a strobe in front of the subject. To identify the key light and where it’s positioned, examine the highlights and the direction of the shadows. The key light, the highlight on the subject and shadow will always be aligned. This helps to identify the location and height of the key light. In our full-length cyclist portrait, the face of the cyclist is fully lit, with a small shadow just to the (our) right of the cyclist's nose. This tells us the light is to the left of the camera at about the height of the rider. It’s common for secondary lights to add a fill light to brighten shadow areas so these might not be as obvious, the key light should be though. Secondary lights are also used to give that rim of highlight, especially on portraits. These are positioned behind the subject pointing towards the camera which then give a highlight on the side of a face, arm or leg. In our example full-length cyclist portrait the Sun has made a highlight on the (our) right of the cyclist’s legs. (For more about rim highlights look up angle of incidence). Reflections in the eyes of a portrait sitter will very often give away clues to the type and location of parts of the lighting setup. The shadows in front of the rider give away the angle of the photographer in relation to the subject and the Sun. The look of the shadow is a big clue to the quality of the light. If it's very dark and has defined edges, its come from a very harsh light source like the shadows cast on a sunny day just like in the full-length cyclist portrait. Softer shadows are made with a diffused light as we see when its cloudy. All light sources are capable of delivering both harsh and soft light quality. How the light is modified before it falls on the subject determines the final quality. All of these little clues help us to build a picture of the entire setup but to fully appreciate the lighting arrangement, every corner of the image has to be examined to pick out the light sources, imagine circling the subject 360 degrees will help to spot where the light is coming from. With practice it will be possible to identify the type of light, e.g. daylight, sunlight, direct or diffused behind cloud, artificial lighting such as tungsten or LED, if it's been diffused, i.e. passed through a translucent material to soften the light and the type of light modifier the light source was in, e.g. a beauty dish, soft box or brolley. Identifying these light specifics needs some experience and it will help greatly to get hands-on yourself to understand how light plays on the subject. 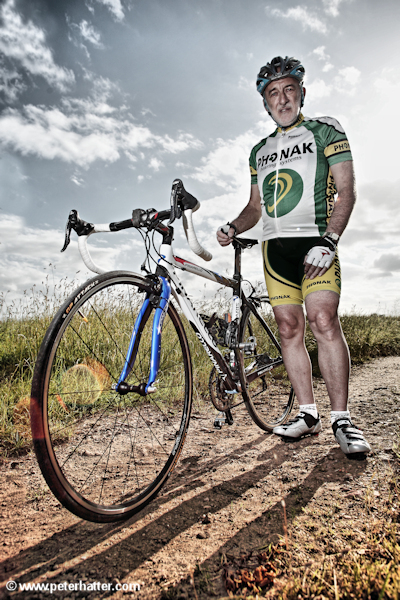 Full-length Cyclist Portrait: The key light is a single strobe on a stand and fired through a brolley to left of camera. The Sun lights the rear of the subject. Cyclist head and shoulder portrait: Natural light, overcast sky. 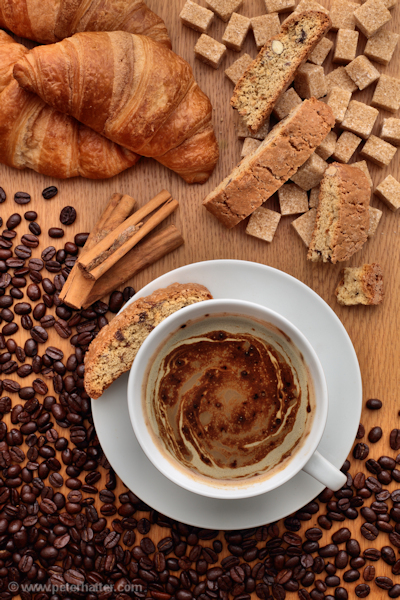 Coffee Flatlay: Natural light passed through a diffuser at the top of the frame. A reflector at the bottom fills in with natural light. Panned motorcyclist: Natural light only. Working out which lens has been used is a little easier than working out lighting but it can still be tricky at times. If there’s a wide view of the scene it’s obvious a wide lens was used. If there’s a tight crop of the subject then a longer focal length was selected. To help with identifying the longer lens, the subject has to be taken in to account, so for instance, if it’s a tight crop of a racing motorcyclist then it’s a good bet to assume a super-telephoto was used. If it’s a tight portrait crop, then it could be a standard lens. So both lenses here give a tight crop but neither would make a good job of photographing the other’s subject. Of course it’s perfectly possible to use a super-telephoto to take a portrait head shot but that would be a little unusual. You’re never going to be able to nail the lens selection down to a specific focal length but it should be possible to have a good idea by seeing how much or how little of the scene has made it in to the image. 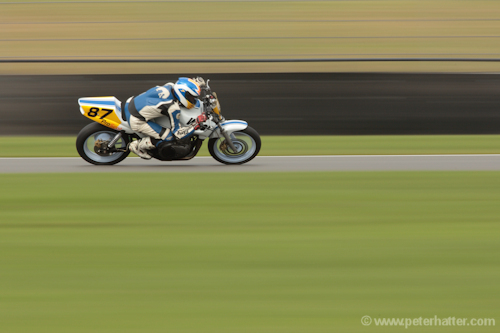 Panned motorcyclist: 300mm + 1.4x convertor. Why consider the aperture? It only regulates how much light passes through the lens right? Well that’s true but it also has an impact on the depth-of-field, or sharpness of the image as well as the brightness of the background when ambient and artificial light is used together. This is another area where we can get very technical and discuss how this works at length but I don’t want to do that here. Having an appreciation will mean further research can give greater detail and depth. For the purposes of this article we’ll assume the aperture has been selected to achieve an accurate exposure first and foremost. If a great deal of the image, from front to back (the depth-of-field), is sharp, it’s safe to assume that a small aperture has been used such as f16. If there’s only a shallow depth-of-field then I’d expect a larger aperture was used such as f2.8. At the same time, the focal length of the lens will also effect the depth-of-field. A wide angle such as a 20mm will always offer a greater depth of field at normally bigger apertures such as F5.6. A 50mm lens at f5.6 doesn’t have the same amount of sharpness so a smaller aperture will have to be used to make the depth-of-field deeper. Just to add a little more detail (or confusion?) how closely the lens is focussed will also effect depth-of-field. So if the lens is focussed very close to the front of the scene, then there will be less sharpness but if you focus further out in to the scene then the depth-of-field increases. 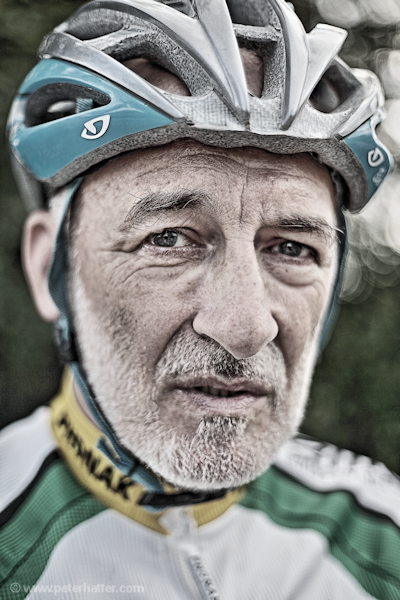 The cyclist portrait has a lot of blur around the edge of the subject which makes him really stand out. This is one of the great benefits of using a large aperture, in this case f1.8. We can see there's a very narrow plane of focus which is typical of a large aperture. See how even his ear is out of focus? Only the eyes and anything on that vertical plane are sharp which is a big clue to the use of a large aperture. Lets quickly look at how the aperture also works with mixed-lighting images. That is ambient and artificial light. If an outside portrait is taken with artificial light like a strobe, the background can be lit only by ambient light. Adjusting the aperture will effect not only the subject but also the background. The subject lighting will have to be adjusted to give the correct exposure for the subject to work with the aperture. The shutter speed also effects the background but less so the main subject because the strobe lights the subject, the flash of light is normally much quicker than the shutter speed duration so the shutter is only ever effecting the ambient light. This is a complex subject so it isn’t easily explained in a paragraph however, again, it’s a place to being to understand what you don’t know and if working with flash and ambient light is of interest then further research and actual shooting of photographs will make it easier to understand. This is a complex issue but to get you off the ground, assume larger apertures (e.g. f2.8) have less depth-of-field and the smaller the aperture (e.g. f11) means more depth-of-field. "Learning how to deconstruct an image or a film is a great way to learn more about the craft of image-making." As with lens angles, the extremes of shutter speed are easier to spot. Where the image features lots of movement and blur then a longer shutter speed will have been used and at the other end of the scale, anything sharp and ‘frozen’ like drops of water will likely have used a fast shutter. Shutter speeds are widely variable but an example of a slowish speed is 1/20th second and a fast speed would be 1/1000th second. Shutter speeds can be measured in minutes or even hours and incredibly short, down to the tiniest of fractions of a second. Spotting something in the middle of the extremes is quite difficult and almost impossible to identify exactly but eventually it’s possible get a feeling for whereabouts along the scale a particular image will sit. If an image captures people walking along a street and there’s a small hint of movement in their legs then a speed of maybe 1/60th second has been used. If there’s no movement then was probably about 1/250th. Sometimes it’s just an educated guess. 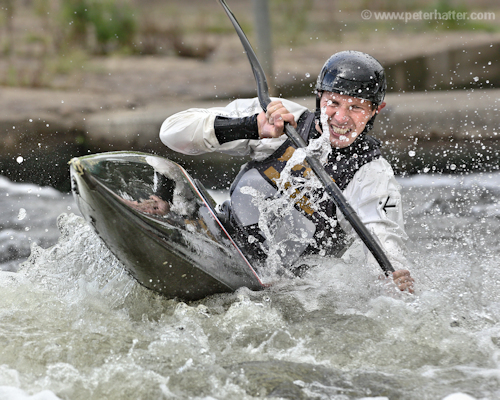 Compare the motorcyclist with the canoeist as these were shot at very opposite ends of the shutter speed scale. See how one features a lot of blur and the other has none at all. Panning the camera with the motorcyclist has left the background as a long 'streak'. An effect only achieved with a long shutter speed and panning the camera together demonstrating how the slow shutter speed can add a level of creativity to the image. Panned Motorcyclist: 1/25th at F22. Whilst we’ve listed the major components that impact on the look of an image, there are other things that make a difference, such as the type of camera, filters, angle of the shot, ISO and post-processing. I’d now include phones in the list of cameras that take great images and it’s quite tricky to say for certain if an image has been made on a phone or a dedicated camera. What about the look of an image from a pinhole camera? These are generally a little softer than normal camera images but even for a camera that’s about as simple as they get, it would be tricky to say that an image hasn’t come from a digital camera but then manipulated to make it look like a pinhole camera image. The ISO settings at the time of exposure have an impact on the aesthetic of the image rather than the technical settings like shutter speed. Lower ISOs record more detail in good light and higher ISOs capture scenes at lower light levels but at the expense of loss of detail. Again this is another setting that’s almost impossible to deconstruct but by looking at the quality of the image a reasonable guess should be possible. Angle is perhaps the most simple deconstruction. If the shot is looking down then the camera was placed above the subject, if the subject is seen from below then the camera was placed low down. Things can get interesting when cameras are placed in interesting places like action cameras for filmmaking. I always enjoy trying to identify where and how ‘they did that’. Finally lets consider post-processing. We all know how easy it is to make changes to an image with software now and this can make deconstruction tricky because some effects that previously only worked in-camera, like blur, can be simulated by software. Images can be made blurry, new photos can be made to look old and old photos can be made to look surprisingly modern. Even a shallow depth-of-field can be simulated by blurring the background in post-processing. Learning how to deconstruct and reverse-engineer an image or a film is a great way to learn more about the craft of image-making. Unpicking the technical makeup helps to expand creative options in future creations. Some techniques may never be used and some might be used all the time. There’s always something new to learn about the art of the still or moving image and one of the best ways to do that is to study and deconstruct work that interests us. All images are © Peter Hatter and used with permission.